BsnTech Networks has completed the design for Miya Clark. 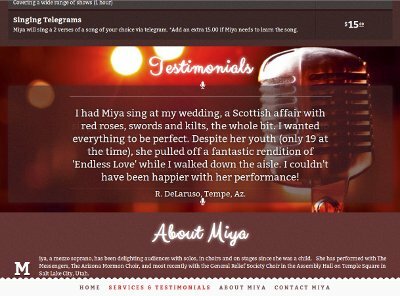 Miya is a singer and wanted to have a personal website to showcase her talents, testimonials, pricing, and a way for potential customers to reach her. One of our website design freelancers completed the site and made a highly unique, one-of-a-kind website for her. The entire website is made on one page. The page has links at the bottom which will automatically scroll to the appropriate text of the site. We appreciate the business that Miya gave us to create the site and hope to continue doing more work for her.